Dai-gensui (grand marshal; literally "great marshal" (大元帥)) was the highest rank of the Greater Imperial Japanese Army and the Imperial Japanese Navy from the 1870s to 1945, when the Empire of Japan was dissolved. Only ever held by the Emperor of Japan as commander-in-chief of the Empire, the rank was equivalent to a generalissimo or general of the armies(army) and lord high admiral(navy). a six-star rank, and senior to the rank of gensui ("marshal"). It formally became obsolete in 1947 when the Imperial Japanese armed forces were abolished. The term originated in the Chinese military title da yuan shuai (大元帥), a title higher than yuan shuai (元帥, pronounced gensui in Japanese). Decree No. 252 by the Dajokan, dated 7 September 1872 first made formal mention of the rank of dai-gensui; however, no appointments to the rank were made before the rank was abolished along with that of gensui on 8 May 1873. By "Draft Ordinance No. 142" of the Constitution of the Empire of Japan (Chapter 1 Part 1) of 30 September 1889, the Emperor was officially given the rank of dai-gensui and installed as supreme commander of the Army and Navy. The kanji characters also refer to a Buddhist deity, Daigensui Myō'ō (大元帥明王), a Wisdom King worshipped by the Imperial Court since Emperor Ninmyō and by the Shingon sect, for its legendary miraculous power to quell foreign enemies and rebellions, just like a military leader. The insignia of a dai-gensui were identical to those of a full general, with the addition of the gold imperial chrysanthemum. 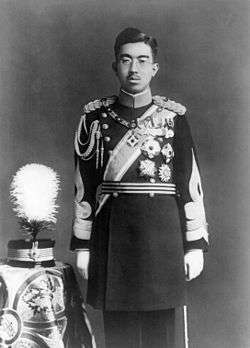 Shōwa Emperor 29 April 1901 — 7 January 1989 1926-1945 Held the rank until 15 August 1945 when Japan surrendered to the Allies, rank officially abolished in 1947. This article incorporates information from the corresponding article in the Japanese Wikipedia.